Los Angeles has one of the largest immigrant communities in the country, with 1.3 million immigrants representing nearly a third of the population. An integral part of the city’s economic and cultural fabric, these Angelenos are as diverse as the city they call home, hailing originally from more than 140 countries and speaking about 86 languages. For many immigrants, integrating into a new community and culture can be challenging, and, for those who seek citizenship, the path can be intimidating and confusing. In response, the Los Angeles Public Library (LAPL) has long strived to serve as a dependable and trusted resource of information to all members of its community. In 2012, the library launched the Path to Citizenship program in collaboration with the United States Citizenship and Immigration Services (USCIS). That award-winning model featured workshops, classes, events, and Citizenship Corners—designated areas dedicated to immigration-related information and resources. More than 55,000 attendees have taken part in the program, which has been adopted by library systems across the country. To build on the success of this program and keep pace with changes around immigration reform at the national level, LAPL decided in 2015 to expand, revise, and scale its services and outreach efforts to immigrants. It enlisted the help of FUSE executive fellow Alex Castillo, who worked in consultation with the library and its public relations office to develop a rebranding and marketing campaign. To build on the success of its citizenship program and keep pace with changes around immigration reform at the national level, the Los Angeles Public Library decided to expand, revise, and scale its services and outreach efforts to immigrants. FUSE executive fellow Alex Castillo worked in consultation with the library and its public relations office to develop a rebranding and marketing campaign. To begin, Castillo delved into LAPL Path to Citizenship services. An estimated 750,000 immigrants in Los Angeles County (nearly half of whom are in the city of L.A.) have legal permanent resident (LPR) status, also called green-card holders. But only about 10 percent of them actually will become citizens. Although this low rate of naturalization is common across the country, the concern is that immigrants may not be aware of the benefits they are missing by not becoming citizens. Among the biggest advantages is the right to vote, which empowers citizens to participate more fully in civic and political life, and gives them a voice in deciding local, state, and national policy. But the benefits of naturalization go beyond the ballot box. Being a citizen opens the door to job opportunities and access to federal grants and scholarships for which noncitizens are ineligible. Naturalization has also been shown to improve social integration. And citizenship, unlike permanent residency, is irrevocable except in extraordinary circumstances. Alex Castillo, who immigrated from Guatemala and grew up in Chicago, began his career in brand management at Procter & Gamble. He specializes in strategy, planning, and brand marketing. With a well-rounded background in consumer products, entertainment, and government, Alex now works for Star Insights, a strategic advisory firm helping leaders in the social-impact sector solve their most pressing challenges. To understand how the library should enhance its citizenship services, Castillo first had to answer a fundamental question: Why weren’t green-card holders pursuing citizenship? 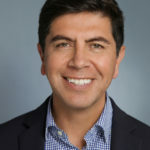 For his market research, Castillo went straight to the source, speaking with immigrants from the community, providers of immigrant support services, immigration officials, library staff, and others. 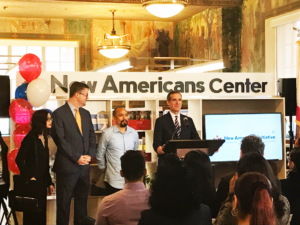 Mayor Eric Garcetti launches the New Americans Initiative to support immigrant Angelenos. He discovered that while many green-card holders aspire to become citizens, certain barriers often keep them from pursuing this goal: the time and cost involved (the application fee is $725); the actual citizenship test, which requires English proficiency and knowledge of American civics; uncertainty around the naturalization process; and lack of awareness about the benefits of citizenship. The library found that the immigrant community had significant needs beyond citizenship support, including help with access to affordable housing, understanding their rights in the labor force, and obtaining bank loans. Castillo concluded that to more powerfully advance the library’s mission of “enriching, educating, and empowering every individual in our city’s diverse communities,” LAPL would need to widely promote its citizenship support, as well as highlight a broader range of services aimed at helping immigrants thrive as residents in Los Angeles. To build awareness of these programs, LAPL also would need to implement a marketing plan. Armed with a goal, Castillo coordinated a marketing campaign with the library and its public relations office in four priority areas of action. Illuminate a Path to Naturalization: Building on the earlier Path to Citizenship program, LAPL leaders replaced the existing Citizenship Corners with 73 mobile New Americans Welcome Stations, stocked with the forms and information required to apply for citizenship. The library also continued to offer classes to help eligible green-card holders prepare for the U.S. naturalization test. Invest in Community Awareness. LAPL saw increases in the number of people attending citizenship classes and visits to its New Americans Initiative website, gains that LAPL attributes to its marketing campaign. Notably for a public agency, LAPL considered marketing and communications central, not incidental, to the success of the initiative and funded these efforts 100 percent. Moreover, LAPL intentionally connected this marketing to its broader organizational branding so it can adapt elements of the campaign for use in future LAPL marketing efforts. Add In-House Expertise. To help deliver its expanded range of services, LAPL had select staff obtain accreditation from the Department of Justice, allowing trained nonlawyers to provide immigration support. By adding this in-house expertise, the library now can design and deliver services directly. Assist All Immigrants: LAPL leaders realized that libraries need to serve as a hub for helping all immigrants navigate the complex immigration process, including obtaining Deferred Action for Childhood Arrivals (DACA) status or one of the several Temporary Protected Status designations. Engage the Latino Population: Because Latinos constitute the majority of immigrants in the city of L.A., LAPL recognized that it could deliver tailored immigration services designed to bring more Latinos through the library doors and, ultimately, increase the proportion of Latinos who hold library cards. All advertising, public relations, digital, and community outreach efforts were executed in English and Spanish, as well as Chinese and Korean to a lesser degree. LAPL also is developing a tailored strategy to further engage the Latino segment of the population. Help Newcomers Integrate: Many factors can hinder the ability of immigrants to integrate effectively into a community. In addition to offering English proficiency classes, the libraries now provide resources for housing, dependent care, labor rights, entrepreneurship, banking and financial management, and more. To help deliver this expanded range of services, select LAPL staff obtained accreditation from the Department of Justice (DOJ), which allows trained nonlawyers to provide direct immigration support. Only two other library systems in the country, the Hartford Public Library and the Oakland Public Library, have DOJ recognition. Historically, LAPL partnered with community organizations to provide onsite immigration services, limiting what the library could offer. By adding this in-house expertise, the library now can design and deliver services directly. LAPL built six New Americans Centers, which are dedicated office and workspaces where people can fill out forms, ask questions, and receive in-person support from trained library and contracted staff. While developing these services, the library simultaneously worked with an external agency to rebrand its immigration offerings. Through research with focus groups and stakeholder interviews, LAPL chose the name New Americans Initiative to reflect the program’s broadened scope. A new logo and tagline were created, and the previous online citizenship portal was replaced with a more user-friendly virtual center that also is optimized for mobile. The program was introduced by the mayor at a launch event attended by civic and business leaders, community organizations, and local press. To coincide with the launch, LAPL introduced advertising campaigns in English, Spanish, Korean, and Chinese across print, billboard, and digital media. To reach even deeper into communities, it also created several collateral materials that were targeted and available to the large populations of Latinos and Asian-Pacific Islanders. These promotional activities surpassed anything the library had done in terms of quality and scale. Almost 1,200 people have participated in immigration service sessions since the program launched in January. From May 2017 to April 2018, the number of people attending citizenship classes increased 13 percent and visits to the New Americans Initiative website increased 91 percent compared to the same period the year before. Expanded services for the community, which include not only English proficiency classes but also resources for housing, dependent care, labor rights, entrepreneurship, banking and financial management, and more. Since the New Americans Initiative launched in January 2018, almost 1,200 people have participated in immigration service sessions. The period from May 2017 to April 2018 saw a 13 percent increase in the number of people attending citizenship classes and a 91 percent increase in visits to the program’s website as compared to the same period the year before, all gains that LAPL attributes to the marketing campaign. In recognition of the New Americans Initiative, LAPL was named one of ten 2018 Top Innovators by the Urban Libraries Council, and the program was featured in one of the most widely read Spanish-language newspapers in the country. Viewing the program as fundamental to the library’s mission, LAPL leadership also decided to fund 100 percent of its costs, which greatly contributed to its overall success. This included significant investments in research, marketing, and communications so that the program would be visible within the community. Notably for a public agency, these efforts were considered central, not incidental, to the program. Moreover, LAPL intentionally connected marketing and branding for the New Americans Initiative to its broader organizational branding so that elements of the campaign could be adapted for use in future LAPL marketing efforts. Additionally, broad internal buy-in was secured from the library staff, who, after working with Castillo initially, assumed full ownership and accountability for the marketing campaign. Of the 38 municipal departments in Los Angeles, LAPL is the only one offering comprehensive immigration services. 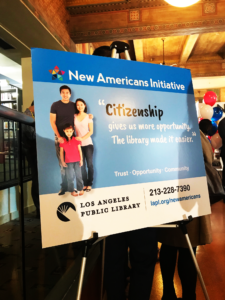 The New Americans Initiative is an ambitious effort by LAPL to push the boundaries of what it means to be a public library, positioning the agency as a leader in the provision of immigration services in Los Angeles.